Ryan Rainey in action earlier this season on the IFS Global Logistics Yamaha R1. Crumlin’s Ryan Rainey has been forced to call time on his racing career for good due to a shoulder injury he sustained following a high-speed crash earlier this season. 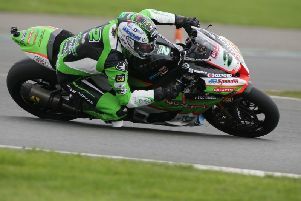 The 35-year-old was struck by another rider at the Masters Superbike round at Bishopscourt in April and has struggled with the injury ever since. Rainey returned to action again later in the season on the IFS Yamaha R1, but his damaged shoulder was having an adverse impact on his performances. After discussing the matter with loyal sponsor Graeme Hanna of IFS Global Logistics, he went for a consultation with a top specialist. Unfortunately, the prognosis was not good and Rainey – who won the Irish Superbike Championship in 2015 on his return to the sport following an eight-year absence – has reluctantly hung up his leathers. “I tried to make a bit of a comeback at Mondello five or six weeks after the crash but I just didn’t have the strength to hold onto the bike and all the changes of direction were really taking a toll on me,” Rainey told the News Letter. Elaborating on the injury, he added: “Graeme said we needed to get to the bottom of the problem once and for all and I went private and saw a specialist in Hillsborough. “I got an MRI test done and it showed that 20 per-cent of the ball joint in my shoulder was squashed inwards. “I could have tried a big operation to set it right, but I’d need four or five months to recover from it. “I was only planning on racing on for maybe one more year and I’m 35 now, so I just decided that it was time to call it quits. I probably wouldn’t have been fit enough at the start of next season, so it just didn’t seem like a viable option. Ryan wished to express his thanks to sponsor and friend Graeme Hanna for his unwavering support plus John Moffett of Balmoral Furnishings.